Brendan Johns (3L) delivered the first Student Scholars Series lecture of the 2015-16 academic year on February 17th. Johns' scholarship, “A Regulatory Balancing Act: Ensuring that Fracking can Thrive in America's Future,” was based on his research of the process used to extract energy resources through the process known as hydraulic fracking. 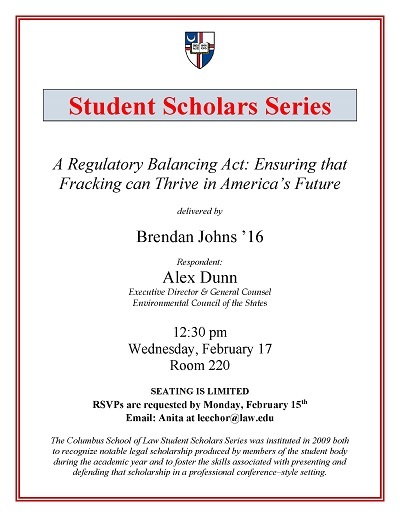 Johns, Brendan, "A Regulatory Balancing Act: Ensuring That Fracking Can Thrive in America's Future" (2016). Student Scholar Series. 17.